Nine people gather at a remote health resort. Some are here to lose weight, some are here to get a reboot on life, some are here for reasons they cana€™t even admit to themselves. Amidst all of the luxury and pampering, the mindfulness and meditation, they know these ten days might involve some real work. But none of them could imagine just how challenging the next ten days are going to be. Frances Welty, the formerly best-selling romantic novelist, arrives at Tranquillum House nursing a bad back, a broken heart, and an exquisitely painful paper cut. Shea€™s immediately intrigued by her fellow guests. Most of them dona€™t look to be in need of a health resort at all. But the person that intrigues her most is the strange and charismatic owner/director of Tranquillum House. Could this person really have the answers Frances didna€™t even know she was seeking? Should Frances put aside her doubts and immerse herself in everything Tranquillum House has to offer a€“ or should she run while she still can? Ita€™s not long before every guest at Tranquillum House is asking exactly the same question. 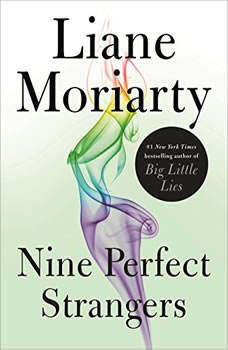 Combining all of the hallmarks that have made her audiobooks a go-to for any listener looking for wickedly smart, unpausable fiction that will make you laugh and gasp, Liane Moriartya€™s Nine Perfect Strangers once again shows why she is a master of her craft. Born in November of 1966, Liane Moriarty was a child who always loved to read. Her career began in advertising and marketing. She became quite corporate for a while and wore suits and worried a lot about the size of her office. She eventually left her position as marketing manager of a legal publishing company to run her own business called “The Little Ad Agency”. After that she worked as a freelance advertising copywriter, writing everything from websites and TV commercials to the back of the Sultana Bran box. After finding out that her sister (author Jaclyn Moriarty) was about to have one of her own novels published, Liane rushed to the computer and wrote a children’s book called The Animal Olympics, which went on to be enthusiastically rejected by every publisher in Australia. She calmed down and enrolled in a Master’s degree at Macquarie University in Sydney. As part of that degree, she wrote her first novel, Three Wishes. Since then she has written five more novels for adults, The Last Anniversary, What Alice Forgot, The Hypnotists Love Story, The Husband's Secret and most recently Big Little Lies. In August 2013 Liane’s fifth novel The Husband’s Secret was released in the US and within two weeks had climbed the charts to become a #1 New York Times Bestseller. Liane's latest novel Big Little Lies was published in July 2014 and debuted at number one on the New York Times bestseller list, making Liane the first Australian author to have a novel debut in the top spot in the US. Nicole Kidman and Reese Witherspoon snapped up the film and television rights. Liane is now a full-time author. She lives in Sydney with her husband and two small children who like to climb all over her while she tries to write helpfully smashing their fists against the keyboard and suggesting she might like to watch the Wiggles instead.